The advent of the mime artist dates all the way back to ancient Greece. The name was derived from a masked dancer known as Pantomimus, and a play by the great tragedian, Aeschylus, Seven Against Thebes is often cited as the first to feature the mime. It is said that the decadent Caligula favored mimes while Nero acted as one. It wasn’t until the early nineteenth century that the emblematic image of the silent figure in white face came into vogue. The mimetic style of acting was used in some of the great cinematic works of German Expressionism, but the most famous single actor -the one synonymous with the style- was the Frenchman Marcel Marceau, whose stage name was “Bip the Clown”. He referred to mime as “the art of silence” and performed around the world for over sixty years, including a major performance to liberating troops in Paris near the end of the Second World War. One of his most celebrated roles was that of Arlequin in the pantomime Baptiste, which was famously interpreted by Jean-Louis Barrault in one of the greatest film masterpieces of all-time, the 1945 Les Enfants du Paradis, by Marcel Carne. Barrault played a famous Bohemian-French mime, who worked in the early 1800’s. 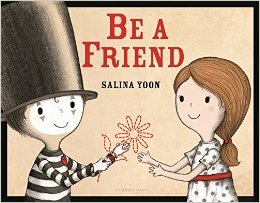 Marceau makes a cameo by way of a sketch drawing hanging on the inside door of a clothes closet in Salina Yoon’s extraordinarily moving Be A Friend, a picture book about a boy mime who finds himself within the seeming constrictions of this highly unconventional mode of expression.